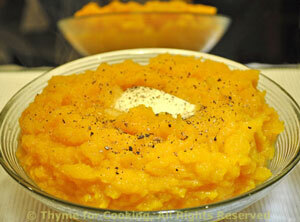 Butternut Squash, Mashed with Cream, gourmet fall vegetables, Thyme for Cooking. Cut squash into 1/2 inch cubes. When done, remove, put into a bowl, add 2 tbs crème fraiche and mash. Spoon into a bowl, make a well and add remaining 2 tbs crème fraiche. Add salt and pepper if using.